The city center during the Battle of Mombasa. The Tanaga district and the NMPD Headquarters can be seen to the right. The city center of New Mombasa was located at the very heart of the city, in the center of the Mombasa Island. The city center housed numerous massive skyscrapers, which easily dwarfed the buildings in the rest of the city. Many of the highest skyscrapers in the city center had 300 stories, with the tallest being the Vyrant Telecom tower in the very center, reaching two kilometers in height. The entire city center itself was part of a large, arcology-like building complex which elevated it above the surrounding terrain. This superstructure was bordered by walls which sloped down to ground level. The Tanaga district, which was home to smaller buildings, was also located within this structure. All of the buildings in the area, including the walled complex on which the skyscrapers stood, followed a standardized, modular design aesthetic. Using metal and blue-green glass as the primary facade materials, most of the buildings were characterized by a flat shape, and were oriented similarly, with their razor-thin sides pointed southwest toward the Indian Ocean. The buildings were also arranged in a way that their height increased evenly on both sides toward the Vyrant tower in the center, giving New Mombasa a distinctive skyline. 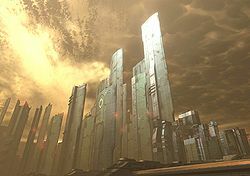 The city center, along with every other sector of New Mombasa, was closed down during the Covenant invasion in October 20, 2552. Immediately after the Prophet of Regret's assault carrier Solemn Penance initiated a slipspace jump in the city, the city was occupied by a Jiralhanae-led invasion fleet and was eventually glassed in order to excavate the Ark Portal. A sign showing the city center closed during the Covenant invasion. Concept designs of the city center's architecture. The city center at night. The city center at night seen from Kikowani Station. New Mombasa's skyline as depicted in an advertisement for New Mombasa Transit Authority.